Verily, Allah enjoins Al-Adl (i.e. 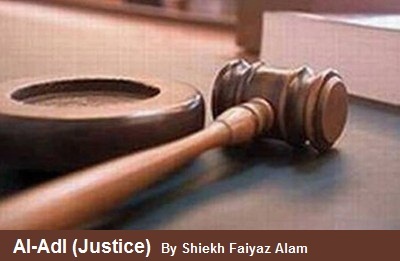 justice and worshipping none but Allah Alone - Islamic Monotheism) and Al-Ihsan [i.e. to be patient in performing your duties to Allah, totally for Allah's sake and in accordance with the Sunnah (legal ways) of the Prophet SAW in a perfect manner], and giving (help) to kith and kin (i.e. all that Allah has ordered you to give them e.g., wealth, visiting, looking after them, or any other kind of help, etc. ): and forbids Al-Fahsha' (i.e all evil deeds, e.g. illegal sexual acts, disobedience of parents, polytheism, to tell lies, to give false witness, to kill a life without right, etc. ), and Al-Munkar (i.e all that is prohibited by Islamic law: polytheism of every kind, disbelief and every kind of evil deeds, etc. ), and Al-Baghy (i.e. all kinds of oppression), He admonishes you, that you may take heed.